Stretching from Mauritania to Guinea, the waters off the coast of West Africa are rich in marine life. But decades of commercial fishing are depleting valuable local fisheries and affecting the lives of millions of people who depend on the sea. From rocky cliffs and broad sandy beaches to extensive sea grass prairies and dense mangrove forests, West Africa's coastline is diverse as it is extensive. The beaches of Cape Verde, Gambia, Guinea, Guinea-Bissau, Mauritania and Senegal are important nesting sites for 5 marine turtle species. And millions of migrating birds from Europe feed along the coast before beginning their homeward trek in the northern spring. Offshore in the cold waters of the Atlantic Ocean, over 1,000 species of fish are found as well as dolphins, whales and seals. Extensive cold-water coral reefs encompass the archipelago of Cape Verde. 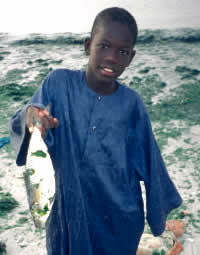 West Africa is one of the most diverse, and economically important, fishing zones in the world. But these waters have suffered from years of overfishing by large, foreign commercial fishing boats and unsustainable fishing practices. WWF is working with West African governments and local communities to improve fisheries management, conserve coastal habitats and species, and support the establishment of marine protected areas. 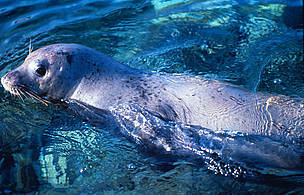 A small colony on monk seals - one of the most endangered mammals in the world - can be found along the coast of Mauritania. A network of marine protected areas off the Senegalese is recognized as a Gift to the Earth, WWF's highest accolade for significant conservation achievements. The protected areas are crucial for safeguarding fish spawning grounds and stock recovery as well as marine biodiversity conservation, including marine turtles and manatees. Other important protected sites along the West African coast include Mauritania’s Banc D’Arguin National Park, Gambia’s Tanji Nature Park and Guinea-Bissau’s Joao Vieira e Poilao Marine National Park. The West African marine ecoregion spans 3,500km of coast and includes 6 countries: Mauritania, Senegal, The Gambia, Cape Verde, Guinea Bissau, and Guinea. Some 8 million people live along this coastline. Fisheries in the West African marine ecoregion generate some US$400 million annually, making them one of the most important sources of foreign exchange in the region. Guinea Bissau hosts the largest breeding population of green turtles in Africa. Cape Verde is the 3rd most important loggerhead nesting site in the world.